For this month’s Moon Lodge on the Hunter’s Moon October 8, 2014, we are continuing the Chakra explorations and are on the Third Chakra dealing with power, will and autonomy. Autonomy is an interesting word defined as a concept found in philosophy as the capacity of a rational individual to make an informed, un-coerced decision. Your truth is not my truth is not his truth. But the question to ask yourself is: at the end of your life, what do you have needed to do so that you can look back and say ‘I did it!’. Odds are it won’t be a fancy house or car or clothes, but it will be something unique to you. Perhaps it is a change in the way you perceive life, react or relate to others or maybe it is pursuing your passion, succeeding or failing but having the courage to try. And try again. If you go within, you will know what it is that you need to do. Chakras are energy centers. Many consider these ‘new agey’, but they are first found in the ancient Hindu religious texts called the Vedas and linked to 1500 BC. The Third is seated at your solar plexus – a ‘braid’ of nerve coming and goings located below your ribcage at the ‘pit of your stomach’. Anxiety and metabolism are also linked to your Third Chakra representing ‘will’ and ‘self-esteem’. Many of us have heard of negative feelings in the ‘pit of your stomach’ and ‘butterflies’, but why not change this to positive? 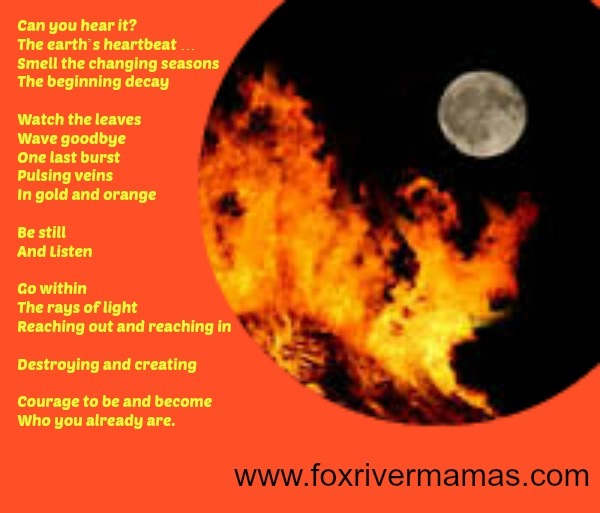 The below ten minute meditation does just that and fits right in with our Autumn Hunter’s Moon and the Element of Fire. You can hear more of my meditations on my YouTube channel here: https://www.youtube.com/user/karenleeduncantim . There you will find a First Chakra Grounding Meditation, a Second Chakra Meditation on Emotions, and a couple meditations for New and Full Moons. Many different cultures and religions over the years have used new and full moons as markers of the seasons and tides in life. They so aptly define the cyclical nature of life that is both repetitive and changing at the same time. A few friends of mine meet in the Moon Lodge to connect, pause, reflect and set intentions for the month. This Wednesday, October 8th, there will also be an eclipse at this full moon which can be seen at 3:14am in the Central time zone in the U.S.A. If metaphorically, the Sun is Source/Life. The Full Moon is a reflection of Source/Life. The Earth being in the path of a Full Moon can be symbolic of our material world getting in the way of a reflection of Love and Light. What do you need to leave behind to be a better reflection of Love? * Parts of the meditation are adapted from Wheels of Life: A User’s Guide to the Chakra System by Anodea Judith. Music is Bonfire by Kevin Kendle’s ‘Autumn’ album and Eleggua by Gary Stroutsos’s ‘Oru – the Natural Order’ album.